The band of brothers is getting back together and taking COD to its former glory amid the bunkers and and rubble of World War Two. The game releases today and as ever brings an enormous haul of modes to your twitchy left mouse button finger. But is that very same finger hovering uncertainly above the ‘buy’ button after previous dodgy COD ports? Well then, allow us to load it up and test it out to ascertain its performance before you buy. 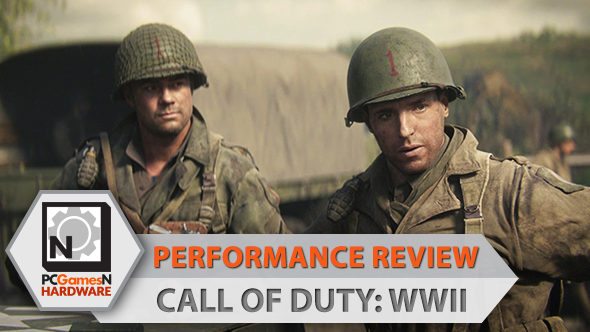 In this performance review we will be using a single card, the trusty Nvidia GTX 1070, paired with an Intel Core i7 2600K and 16GB RAM, to cycle through the graphics options and analyse the varying degrees of performance COD: WWII offers at different settings. Let’s start with the graphics options menus. Get to grips with Call of Duty: WWII’s new class system with our Divisions guide. 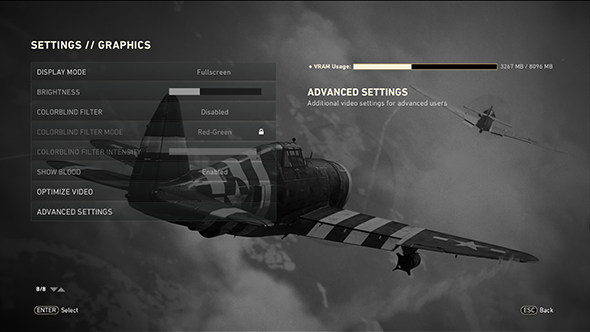 Overall, it is a win for COD: WWII based on the suite of options it offers, although annoyingly it does not give you presets to cycle through. Instead, it offers to analyse your system and auto-fiddle with the advanced options in order to hit that sweet spot. It is a welcome inclusion for those who do not feel inclined to agonise over different AA options, but if you are reading this article then you are probably not one of those people. But for that omission, the game cannot be faulted on any other grounds found in these menus. 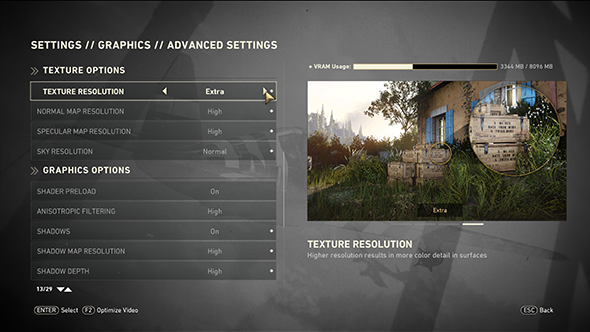 PCGamesN’s own Kirk and his 2.7 million colourblind kin will be pleased to observe not just a colorblind mode, but tweaking options to adjust the intensity and filter type. Having any kind of colorblind consideration is still a rarity in games, so well done Sledgehammer for including this. 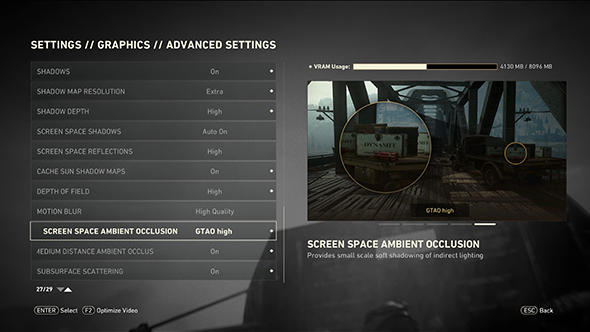 It is also very useful to see the VRAM usage meter over on the right, as seen in Ubisoft’s PC ports. It is not a failsafe measure of what your PC can hack – the game seemed confident that running max settings at an upscaled 5120×3200 would use less than half my available GPU memory – but it is a handy indicator when used in conjunction with old-fashioned sight tests. Oh, about that: there is no performance benchmark. Not a massive deal, since most games do not have one. Heading into the advanced options gives you a total of 29 different elements to tweak. This is where the absence of presets is felt most keenly, as it is laborious to scale each option up or down individually. On the plus side, 29 separate options is a lot. If you cannot find a configuration that works for your system, you are running the game on a potato clock. Of note within this menu is a visual illustration for each option, which gives some idea of what it is you are changing and how it will affect the appearance of the game. You are unlikely to become an expert in ambient occlusion techniques by reading ‘provides small scale soft shadowing of indirect lighting’ but you will at least grasp whether it will make your game look better or worse. Sledgehammer’s filmic SMAA T2x deserves mention, too, delivering a distinctive Saving Private Ryan look to the game without taking too much of a performance hit. In lieu of game-sanctioned presets, we created four fidelity points using the graphics options: max, high, medium, low. All were tested at 2560 x 1600 resolution. And let’s start by saying this is the best-looking COD for a long time. Not speaking empirically, since it’s bound to look better than its ancestors, but compared with its contemporaries right now. We are seeing the benefit of PS4 Pro and Xbox One X here on PC in the increased texture resolution of games like this. It is especially noticeable in faces and uniforms, but also evident in each location’s set dressing and the weaponry and equipment of the time. COD: WWII is breathtaking when you turn every option up as far as it will go. This still image does not really do the quality of its depth-of-field, motion blur, and film grain effects much justice, but you can see the quality of shadows cast beneath the camo net, the handprint of protagonist Red, and the soft-edged filmic AA at work. Smoke and fire effects look wonderful at these settings too, and this being World War Two, they tend to crop up a lot. My system handled this lot at around 75fps – at 1600p, mind – with only occasional dips into the 50s when hitting a checkpoint or entering an in-engine cutscene. The important thing is that I experienced no dips during gunfights, whether fire effects or grenades were onscreen or not. As is often the case in these performance reviews, the difference between max and high settings is not easily conveyed in a still screenshot. Opening the larger version of this one, you will notice that the AA is not quite as meticulous about those telephone wires in the middle-distance, and that the ground textures in the near field look visibly lower resolution. On my system this scaling back resulted in a gain of about 5fps, and since I was well clear of 60fps in the first place, it is not worth the loss in fidelity in this particular case. If your own system is hovering around the 60fps mark, it is an acceptable tradeoff for the additional frames you need. It is starting to look more like the standard PS4 version now with all 29 graphics options configured to hid a medium point. The texture detail on Red’s gun is notably lower, as are larger textures on the wall and floor. Those artillery shells are much simpler, and the reduced AA is making jaggies appear on the reflections bouncing off helmets as well as those phone lines now. It still looks impressive in motion, but the difference between this and max settings is quite significant. In my case, that significant drop netted average frame rates of around 90fps, so again, it is an acceptable tradeoff if you are looking to VSync at a higher refresh rate. Or if you are super competitive about multiplayer and find 60fps like wading through treacle. 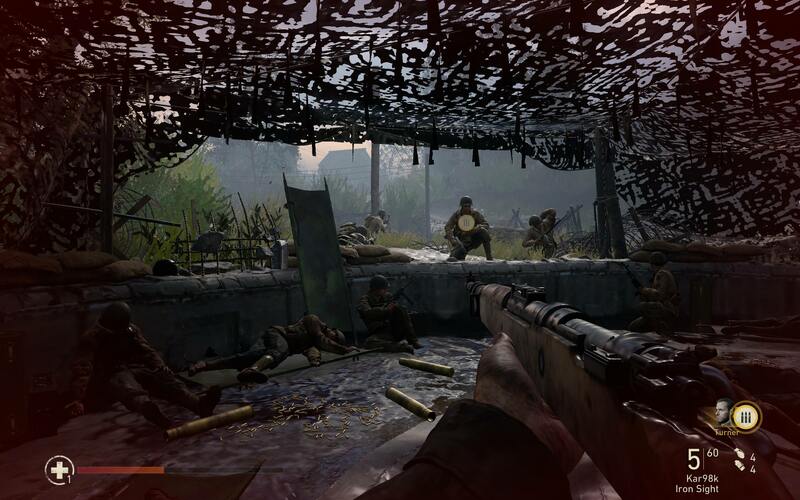 Even without opening the larger version of this screenshot, you can probably see that we have almost regressed back to the first Call of Duty at this point. And while that is a massive exaggeration employed purely for comic effect, the reduced texture detail and absence of any shadows are quite obvious. What was blood pooling at medium settings has become an unspecified dark area. What was once a rifle now appears to be a young child’s drawing of a rifle. It is a hard fidelity level to live with, but it produced about 112fps on average for me at 1600p, so it does demonstrate that this game engine is very scalable. To see how Call of Duty: WWII performs on various hardware setups, we test the game on four graphics cards: two from Nvidia and two from AMD. We have sampled popular cards from the current and last generation of GPUs in order to offer the most useful information. All four cards are tested at ultra settings, with every texture option set as high as they will go and every graphical effect turned on. For the test we play a 60-second sample that involves running, jumping, shooting, and melee combat. The same section is repeated three times in order to find an average. In the graph below you can see how all four cards perform. 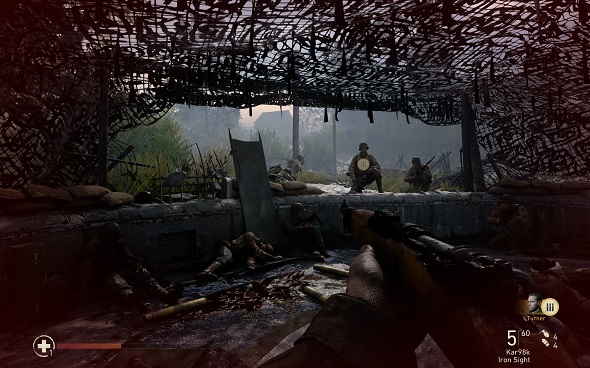 More good news for PC gamers looking to pick up Call of Duty: WWII – all those filmic graphical details are available at good frame rates, even if you are not gaming on a high-end rig. Running ultra settings at an average of 59 frames per second on an R9 380 is no mean feat, especially for a game as handsome as this. 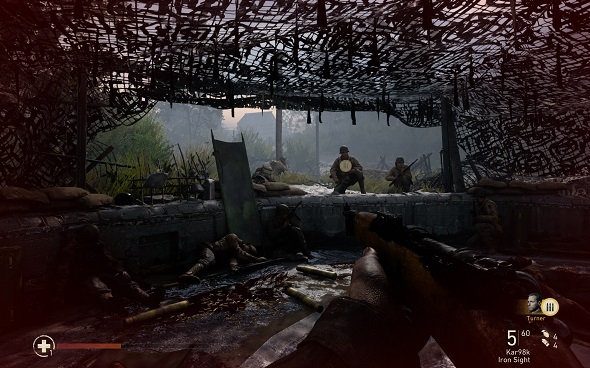 Boasting some of the most realistic particle effects, lighting, and motion blur in gaming, you would expect performance on all cards to take a hit, but COD: WWII will hit that all-important 60fps average on mid-range hardware without any sacrifices to fidelity. The good news is that unless you are running the latest COD on budget-end card, you should be able to hit 60fps on ultra settings with ease. The only exception in our testing is, predictably, with the R9 380, the lowest spec GPU we use. 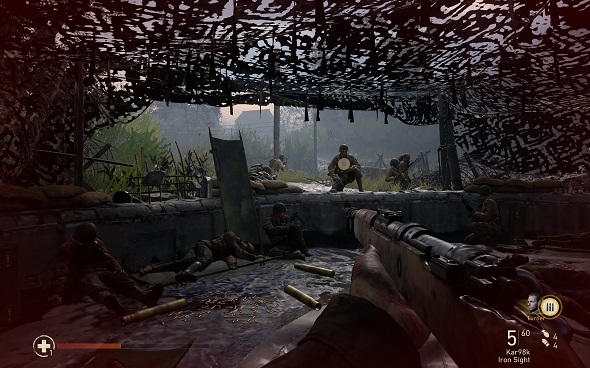 It should only take a couple of almost imperceptible tweaks to the COD: WWII graphics options to push it over the threshold, and with 29 settings to tweak and a handy visual representation of how it will look once you have made the change, finding a setup that works for you should not prove difficult. COD: WWII gets a lot of things right, then. At its highest settings it is capable of real visual splendour and has obviously been developed with a keen eye on PC. What’s more, it does not demand the world from your machine to hit those highs, unlike several recent – and much less handsome – CODs. Right down at the lowest settings it offers a reasonable entry point for gamers hitting the minimum system specs, although a lot of the spectacle is lost in those graphics menus. For the stability of its performance and the swathe of options it offers, Call of Duty: WWII gets a pass.